This season, a friend reminded me, investing in personalised gifts is a great way to invest in friendships. What better way to show your love and appreciation for your favourite girls than sharing a gift box which includes their favourite personal care and beauty products! Let’s spend a little extra time giving thoughtful gifts this year and you won’t have to do it alone because I’m here to help, loves! Let’s get to right to it with 6 gift ideas for a woman who encouraged and supported you to live your best life in 2018! 6 Days Of Kasha is all about making your shopping experience easier, more convenient and of course enjoyable, just as gifting is. If you know your favourite girl has little time to treat herself, you’re in the right place . 1. Friendly to the earth, friendly to the pocket and holds up to 3 times the fluid of an average pad or tampon, I would like to to introduce a personal fave, the Grace Cup as a great gift to your girls! 2. You can also share the Kasha Gift Voucher which gives your loved one the freedom to select exactly what they would like. This is perfect if you have no idea where to begin! 4. For some women, there’s nothing more satisfying than the experience of silky smooth legs! 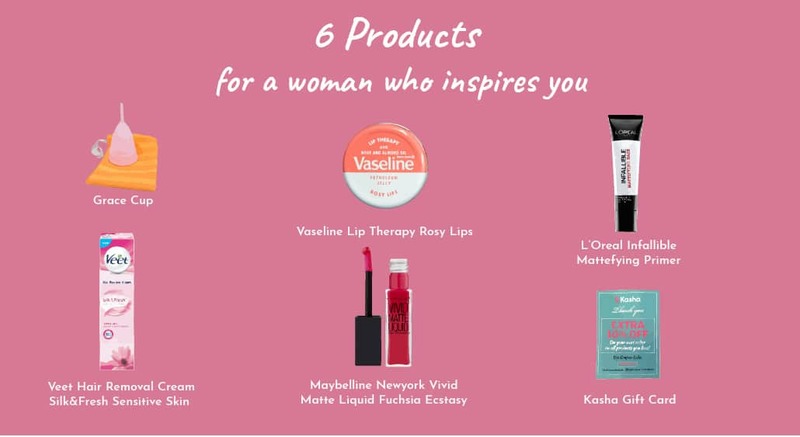 If this is the woman who inspires you, Veet Hair Removal Cream is just what you need to throw in the gift bag. With hydrating properties, this hair removal cream adds nutrients to your skin and smells so good that this might just turn into a whole spa session! 5. Why not add a face mask or a gentle exfoliating facial scrub for a full beauty experience! 6. Now, there’s a reason our favourite YouTube Beauty Gurus have been screaming the wonders of this Hydro boost Micellar Water all year!This unique facial cleanser is kind to skin, removes makeup and impurities while giving you the hydration boost your skin deserves. Make sure to care for your skin a little more during this season of parties and lots of makeup. But before you take it off, I’d love to see your favourite looks of the season! Share with me on veronica@kasha.co.ke and we can all learn a thing or two from you!